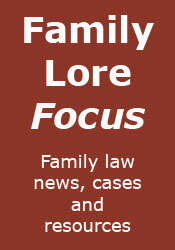 Family Lore: Venal & Grabbit win contact case! Little bit too dry for me this John. Bit too close to the mark I'm affraid. 1st and 2nd times I read it I thought it was real. Third time I half got the (black) joke. You make an excellent point! Money can indeed buy you an excellent barrister, increasing significantly your chances of winning the case. As a litigant-in-person, in a 'leave to remove' case, I 'went a few rounds in the ring' with a top London barrister. Needless to say that Goliath gave David a right good battering! At stake, however, were the best interests of my children. The British judiciary saw fit to allow and encourage the legal case against overseas removal of the children to be prepared and presented by an emotionally-involved and legally-untrained lay-person (their father). Who else would relish such representation in court??? Upon appeal, I suggested to Sir Nicholas Wall that such an un-level playing field was surely not in the best interests of the children, and that they really deserved to have independent legal representation (as they do in New Zealand). Wall agreed, but refused my request because of a lack of finances from the MOJ. He did, however, say that I had a very good point and suggested that I take the matter to the ECHR, adding that this may help to improve the British system. I took his advice. The ECHR appeal is pending.